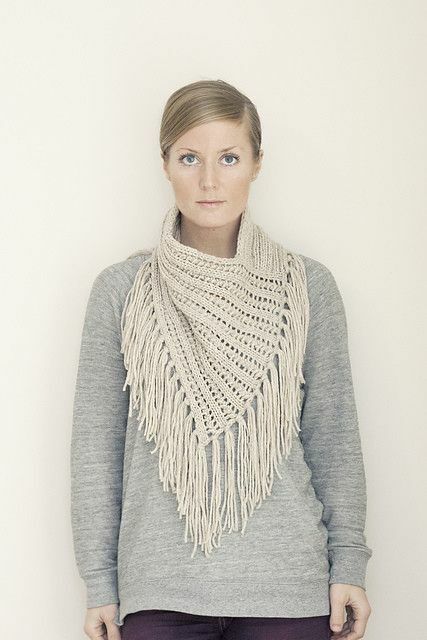 Clever construction transforms a short scarf into a dynamic cowl. The first half is knit in a cushy 2 x 2 Ribbing creating a double layer of comfort while reducing bulk at the back neck. The second half transitions beautifully to an Eyelet Ribbing. The finished piece is blocked asymmetrically to create the flattering kerchief shape. Fringe is added to the outside border completing the look perfectly. 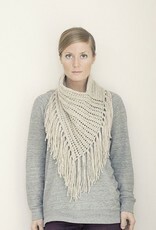 This cowl is fast and fun to knit and absolutely effortless to wear. It pairs beautifully with a denim top and looks just as fabulous worn over a tank in the summer making it a very versatile accessory for year-round wear. An ideal gift knit or instant gratification knit for yourself!